David G. Hebert is a professor of music with Western Norway University of Applied Sciences, and in 2018 he became the manager of NNME. He is also a Professor II in Sweden in the Malmo Academy of Music (Lund University), and a Hanban Visiting Scholar in the Central Conservatory, Beijing, China. A widely published and cited researcher, he has also held positions with universities in the USA, Finland, Japan, China, Russia, Brazil, and New Zealand, and has directed research projects on six continents. Dr. Hebert is a frequent keynote speaker for conferences, and an editorial board member with such scholarly journals as Arts Education Policy Review and Music Education Research. His writings appear in over 30 different professional journals, and his books – as author, editor, or co-editor – include Wind Bands and Cultural Identity in Japanese Schools, Theory and Method in Historical Ethnomusicology, Patriotism in Nationalism in Music Education, International Perspectives on Translation, Education and Innovation in Japanese and Korean Societies, and Music Glocalization: Heritage and Innovation in a Digital Age. 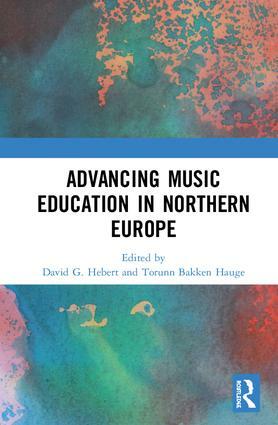 He has also published chapters in Oxford Handbook of Music Education, Routledge Research Companion to Popular Music Education, Sociology and Music Education, and Multicultural Perspectives in Music Education (vols. 1 and 2), and with William Coppola he is now co-authoring World Music Pedagogy: Music in Higher Education (forthcoming, Routledge). Torunn Bakken Hauge is a professor of music education with Western Norway University of Applied Sciences, where she has taught for more than four decades. She is a founder and managing coordinator of the NNME, which has government funding for cooperative projects across all Nordic and Baltic countries, and celebrated its 20-year history in 2017. Since 1990, she has also managed the Nordplus-funded Teacher Education Network, which supports interdisciplinary arts projects in teacher education. A Nordic pioneer in the field of rhythmic music pedagogy, she is a producer of the video Rytmisk musikkpedagogikk i grundskolen (1999), first author of the book Rytmisk musikkpedagogikk i grundskolen (2000), and executive producer of the pedagogical CD Kotokaka rytmisk musikkpedagogikk (2002). She has also published research articles in English in such journals as Signum Temporis, International Journal of Education and the Arts, and a chapter in the book Musikk – Mulighetenes fag (2007). Additionally, she is a singer in a professional early music vocal quartet.